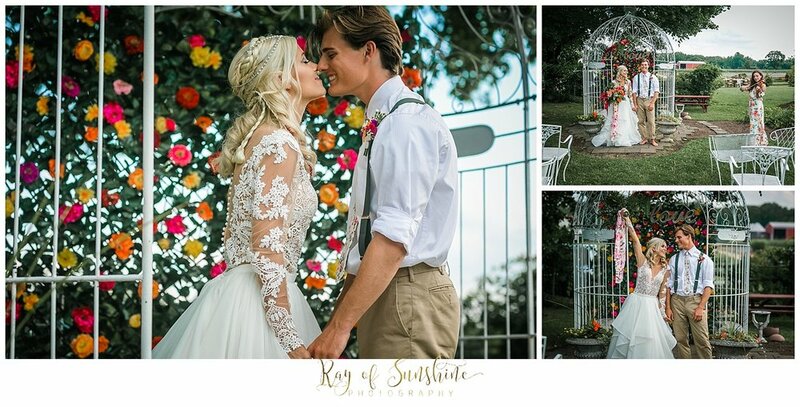 Creating styled shoots is now one of my favorite things to do in my free time! I have always loved decorating and design so to be able to come up with wedding concepts and collaborate with amazing wedding vendors to make my ideas come to life has been so enjoyable. 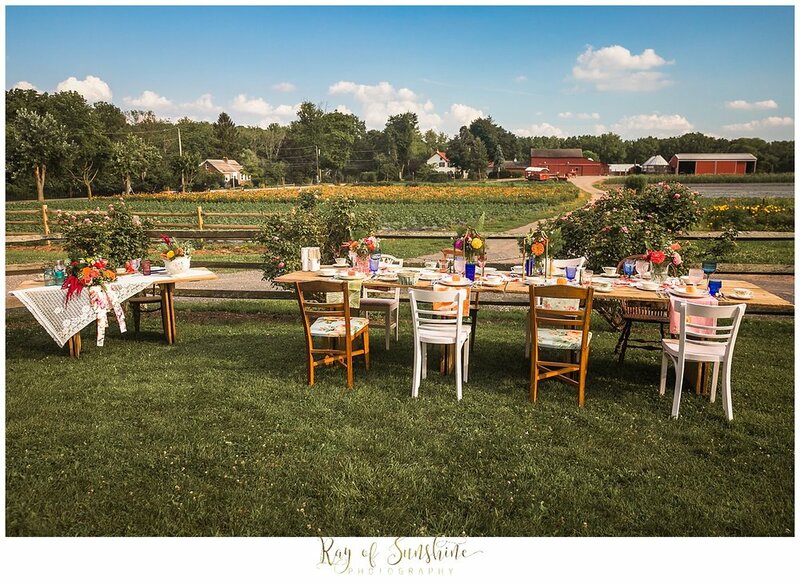 Our latest styled shoot took place at one of my favorite locations, Maple Acres Farm located in Plymouth Meeting. They have pick your own fruits and veggies and of course their gorgeous zinnia flower fields. You can also stop by to see the animals, get fresh produce, and pick up some cute baby chicks in the spring. 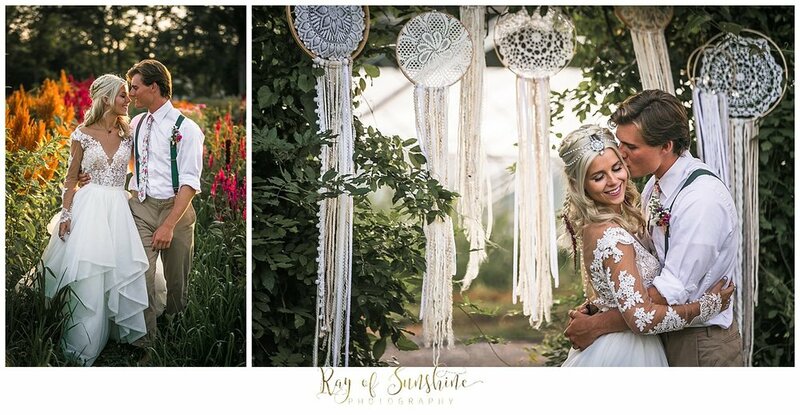 We had 21 different vendors be a part of this bohemian farm inspired shoot and they all killed it! For our dessert table we had delicious cake pops by Twinkle Bakery, cookies provided by Crave Dessert, and a great 3 tiered cake by Beverly's Pastry shop who also used some of the flowers from the farm to enhance it. I loved how all three of these vendors worked together to provide a cohesive colorful palate of tasty treats! We also had the pleasure of having the Milk & Sugar food truck stop by to make some custom cupcakes on the spot. Definitely check them out, they were so delicious! 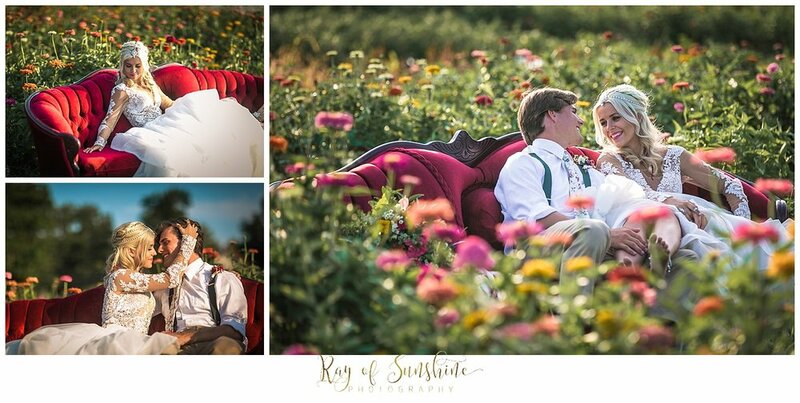 Mackenzie and Tyler were the perfect models for our shoot, happily in love and totally pulled off the bohemian look. Mackenzie wore a lace bodysuit and big layered skirt from Philly Bride. Bare Sandals provided a jeweled headpiece and matching feet jewelry. Dear Isabella supplied the beautiful blue stoned rings and earrings. Tyler was rocking his flower tie and army green suspenders from Amazon! Our hair inspiration by Heather Vellner was to do braids and curls. We also attached pieces of flowers to her hair! Elegance Artistry did a spectacular job on make up and if you look closely Sara hand painted flower designs on Mackenzie's eyelids. 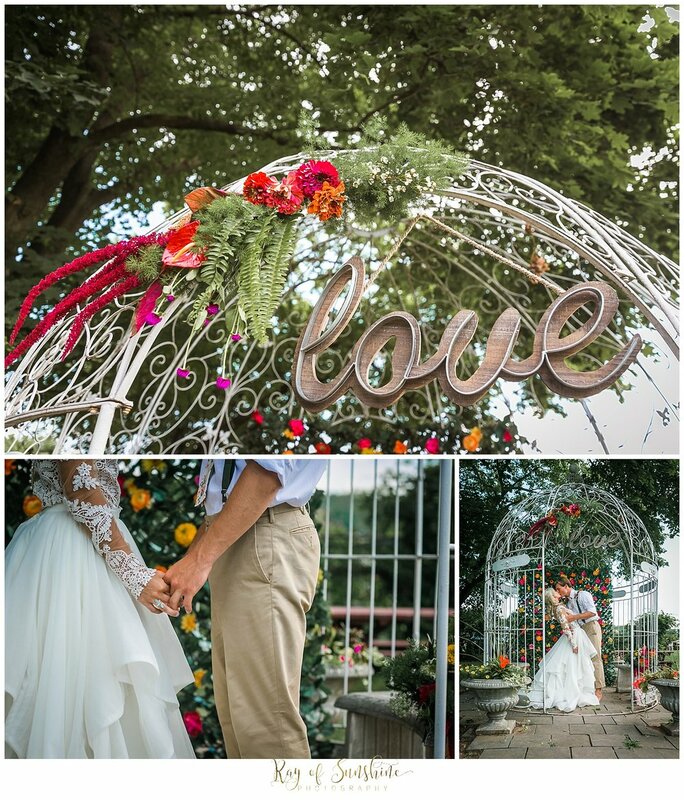 Our ceremony was held under Maple Acre's gazebo adorned with a gorgeous flower wall by the Flower Wall Co. Bloomsbury did a beautiful yet simple greens and flower arrangement with the Love sign hanging down from the gazebo. The bouquet Bloomsbury Floral Design created was a dream! She was able to use a lot of flowers directly from Maple Acres and add in some other colors and greens. The silk ribbon really tied it all together. We also had Miss Musique join us to serenade us during the ceremony. 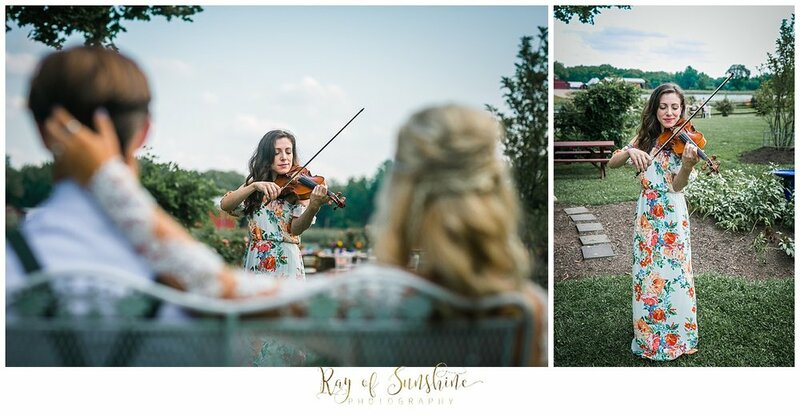 I think we all were captivated by her beautiful music and is the perfect addition for your romantic ceremony! We put together an outdoors reception area complete with a sweetheart table and a 12 foot wooden table by T&T farm tables. All the vintage tableware, chairs, and linens were done by Savannah Home Vintage. We did a lot of different mismatch prints and textures and I love how it all tied together cohesively. Everlaser designs made custom wooden signs for the back of the chairs that said bride and groom as well as the bright pink cake topper. I loved the vibrant colors that went perfectly with our theme. And what's a party without some cocktails! Our friends at 13th Street Cocktails came by with their latest addition to their fleet, their horse trailer bar. I love their live wood edge shelf design they did and who doesn't love a preinstalled coffee maker as well! T&T also brought this awesome beer tap to serve 4 different beers from. We even had the farm's pony over for some photos. Lastly, we had Little Pearl Designs create custom place cards for guests which had moss attached to the bottom and they were hung beautifully in a tree for guests to find. They also did a beautiful job creating an invitation suite with hand painted watercolor flowers and my favorite- vintage flower stamps! The best part is we had City South Films there to document all the hard work all of us did to put together this styled shoot. Check out the film here and the final product pictures below! All vendors websites are listed below, definitely worth checking out if you're still looking for wedding vendors for your wedding!